When a book is tagged as one of the most requested books by prisoners (of all people) in the realm of prison libraries, we should all wonder what's in it. Referred to as a "mega cult classic" by some, this book has quietly spread step by step instructions to predators all over the world on how to manipulate and control others for the purpose of self empowerment and personal gain. Written in 1998 by author Robert Greene, this book has had a significant impact throughout the business sector worldwide as entrepreneurs have looked to it to solve their personal problems in cunning manipulative and deceptive ways. Many of us may have heard of this book from other CEOs, entrepreneurs and money minded people we know or perhaps you came across the book in some other way. 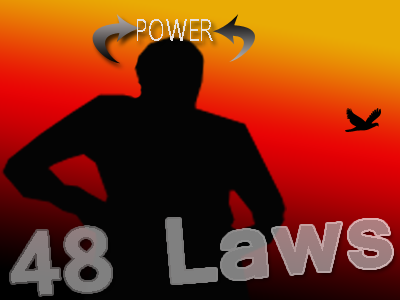 The book is titled 'The 48 Laws of Power', and few are aware of the influence and the impact this one book has had on our society and how this book has been taken to heart by many control-minded freaks worldwide. Incidentally, the author is also the writer of books such as 'The Art of Seduction', 'The 33 Strategies of War', and 'Mastery' among other titles, get the picture? Not so surprisingly, in his writings and in particular 'The 48 Laws of Power' Greene trivializes, devalues and discredits the notions of morality, dignity, honestly, transparency, humility, truthfulness, frankness, good intentions and candidness, all in exchange for self preservation, deceit, manipulation of others and maintaining of control. He paints all forms of honesty and virtue as traits indicative of weakness and a weakness that should be exploited by the strong power-hungry glory-seeking (business) warrior. Wondering how the level of corruption got to where it is today? Want to understand why and how rampant corruption and criminality exists all around us especially in business? Don't underestimate the reach and impact this single book has had on power seekers all around the world who are looking to dish out their exploitative ideologies of manipulation, deceit and control. Sadly those who push these survivalist and oppressive ideologies are propped up and praised by the likes of New York Times, awarded for their work and worshipped in many corporate circles around the globe as gurus of knowledge. Despite his record of writing books which seem to glorify destruction, deception and control of people, Green has sold over 1.2 million copies in the United States alone and has translated the book into 24 other languages. Disturbingly, Greene even has a strong contingent of "followers" in Washington D.C.. In fact, here's a quote from his biography posted on Amazon. "In addition to having a strong following within the business world and a deep following in Washington, DC, Greene's books are hailed by everyone from war historians to the biggest musicians in the industry"
In his deeply deceptive book 'The 48 Laws of Power', Greene instructs readers just how to lie and manipulate others to ensure that you maintain power over them. He stops at nothing to paint an incredibly dark picture of humanity which cannot be trusted because everyone is secretly trying to bring you down. He makes sure readers know how to ruin someone's life, cut them off, embarrass them, teach them a lesson, study them, belittle and discredit them and leave them abandoned from the reader's personal circle of power if necessary. For anyone with an ounce of integrity, love and compassion for humanity, reading this book may shock you. A read through any of Greene's books may disturb the reader and awaken them to what we are dealing with today in terms of corporate and governmental corruption and deception for the purposes of personal gain and control. For years, psychopaths and control freaks who seek power have studied and applied 'The 48 Laws of Power' on other innocent people while arming themselves against humanity for maximum exploitation, damage and destruction. Always make those above you feel comfortably superior. In your desire to please or impress them, do not go too far in displaying your talents or you might accomplish the opposite— inspire fear and insecurity. Make your masters appear more brilliant than they are and you will attain the heights of power. Be wary of friends— they will betray you more quickly, for they are easily aroused to envy. They also become spoiled and tyrannical. But hire a former enemy and he will be more loyal than a friend, because he has more to prove. In fact, you have more to fear from friends than from enemies. If you have no enemies, find a way to make them. Keep people off-balance and in the dark by never revealing the purpose behind your actions. If they have no clue what you are up to, they cannot prepare a defense. Guide them far enough down the wrong path, envelop them in enough smoke, and by the time they realize your intentions, it will be too late. When you are trying to impress people with words, the more you say, the more common you appear, and the less in control. Even if you are saying something banal, it will seem original if you make it vague, open- ended, and sphinxlike. Powerful people impress and intimidate by saying less. The more you say, the more likely you are to say something foolish. Reputation is the cornerstone of power. Through reputation alone you can intimidate and win; once it slips, however, you are vulnerable, and will be attacked on all sides. Make your reputation unassailable. Always be alert to potential attacks and thwart them before they happen. Meanwhile, learn to destroy your enemies by opening holes in their own reputations. Then stand aside and let public opinion hang them. Everything is judged by its appearance; what is unseen counts for nothing. Never let yourself get lost in the crowd, then, or buried in oblivion. Stand out. Be conspicuous, at all cost. Make yourself a magnet of attention by appearing larger, more colorful, more mysterious than the bland and timid masses. Use the wisdom, knowledge, and legwork of other people to further your own cause. Not only will such assistance save you valuable time and energy, it will give you a godlike aura of efficiency and speed. In the end your helpers will be forgotten and you will be remembered. Never do yourself what others can do for you. When you force the other person to act, you are the one in control. It is always better to make your opponent come to you, abandoning his own plans in the process. Lure him with fabulous gains— then attack. You hold the cards. Any momentary triumph you think you have gained through argument is really a Pyrrhic victory: The resentment and ill will you stir up is stronger and lasts longer than any momentary change of opinion. It is much more powerful to get others to agree with you through your actions, without saying a word. Demonstrate, do not explicate. You can die from someone else's misery— emotional states are as infectious as diseases. You may feel you are helping the drowning man but you are only precipitating your own disaster. The unfortunate sometimes draw misfortune on themselves; they will also draw it on you. Associate with the happy and fortunate instead. To maintain your independence you must always be needed and wanted. The more you are relied on, the more freedom you have. Make people depend on you for their happiness and prosperity and you have nothing to fear. Never teach them enough so that they can do without you. One sincere and honest move will cover over dozens of dishonest ones. Open-hearted gestures of honesty and generosity bring down the guard of even the most suspicious people. Once you selective honesty opens a hole in their armor, you can deceive and manipulate them at will. A timely gift— a Trojan horse— will serve the same purpose. If you need to turn to an ally for help, do not bother to remind him of your past assistance and good deeds. He will find a way to ignore you. Instead, uncover something in your request, or in your alliance with him, that will benefit him, and emphasize it out of all proportion. He will respond enthusiastically when he sees something to be gained for himself. Knowing about your rival is critical. Use spies to gather valuable information that will keep you a step ahead. Better still: Play the spy yourself. In polite social encounters, learn to probe. Ask indirect questions to get people to reveal their weaknesses and intentions. There is no occasion that is not an opportunity for artful spying. All great leaders since Moses have known that a feared enemy must be crushed completely. (Sometimes they have learned this the hard way.) If one ember is left alight, no matter how dimly it smolders, a fire will eventually break out. More is lost through stopping halfway than through total annihilation: The enemy will recover, and will seek revenge. Crush him, not only in body but in spirit. Too much circulation makes the price go down: The more you are seen and heard from, the more common you appear. If you are already established in a group, temporary withdrawal from it will make you more talked about, even more admired. You must learn when to leave. Create value through scarcity. Humans are creatures of habit with an insatiable need to see familiarity in other people's actions. Your predictability gives them a sense of control. Turn the tables: Be deliberately unpredictable. Behavior that seems to have no consistency or purpose will keep them off-balance, and they will wear themselves out trying to explain your moves. Taken to an extreme, this strategy can intimidate and terrorize. The world is dangerous and enemies are everywhere— everyone has to protect themselves. A fortress seems the safest. But isolation exposes you to more dangers than it protects you from-it cuts you off from valuable information, it makes you conspicuous and an easy target. Better to circulate among people, find allies, mingle. You are shielded from your enemies by the crowd. There are many different kinds of people in the world, and you can never assume that everyone will react to your strategies in the same way. Deceive or outmaneuver some people and they will spend the rest of their lives seeking revenge. They are wolves in lambs' clothing. Choose your victims and opponents carefully, then— never offend or deceive the wrong person. It is the fool who always rushes to take sides. Do not commit to any side or cause but yourself. By maintaining your independence, you become the master of others— playing people against one another, making them pursue you. No one likes feeling stupider than the next person. The trick, then, is to make your victims feel smart— and not just smart, but smarter than you are. Once convinced of this, they will never suspect that you may have ulterior motives. When you are weaker, never fight for honor's sake; choose surrender instead. Surrender gives you time to recover, time to torment and irritate your conqueror, time to wait for his power to wane. Do not give him the satisfaction of fighting and defeating you— surrender first. By turning the other cheek you infuriate and unsettle him. Make surrender a tool of power. As you can see, the goal from square one is to deceive others in order to obtain and solidify power. The laws get worse as you read on. For example, law 27 states:'Play on People's Need to Believe to Create a Cultlike Following' and law 33 encourages readers to actually exploit other people's weaknesses! The list goes on and on. Never in this book is honesty and truth considered as something valuable or good. Instead honesty and truth are portrayed as weaknesses that must be overcome in order to succeed in obtaining personal empowerment. It's no wonder we are experiencing an unsettling level of corporate evil and greed that most of us never imagined could be. The 48 Laws of Power allows us to recognize one of the ways deception and greed was sold to business owners and entrepreneurs world-wide under the guise of 'self help'. The cold reality is that this cut-throat mindset is now seen as the norm by many of today's corporate owners. These negative energies and eugenic ideologies that separate humanity into those that control versus those who are controlled are lies. The ideas that separate us into those that are superior versus those that are inferior are lies of hatred and deceit and are all rooted in eugenics. Unfortunately, there will always be individuals who really believe they are greater than others and they will always feel the need to control others. It is up to us, those of us connected to humanity and consciousness, to expose these efforts and allow future generations to purge and expose these ideologies as one of the psychological poisons that has infected our human race to the demise and enslavement of many.